NETWORK UPDATE: Game 3 of the WORLD SERIES adjusted up 0.1 to 3.2. Complete World Series Game 3 ratings coverage here. In addition, LAST MAN STANDING gained 0.1 in final numbers. CABLE HIGHLIGHTS: Discovery’s GOLD RUSH took Friday cable, even though it eased off by 0.04 from last week to 1.09, and lead-out PACIFIC WARRIORS dropped 0.07 to 0.35. ESPN’s NBA doubleheader was at 0.91/0.87, and various pieces of its daily programming filled 5 other slots in the day’s Top 10. 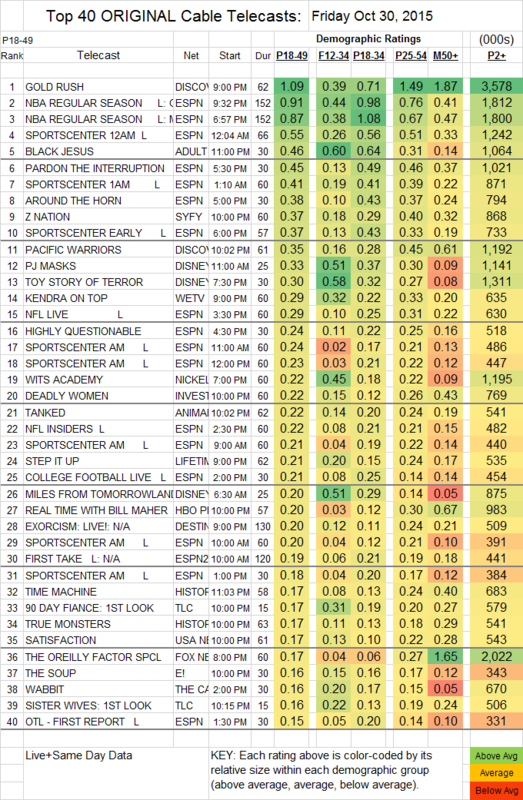 Adult Swim’s BLACK JESUS lost 0.08 to 0.46. On Syfy, Z NATION gained 0.07 to 0.37 on Halloween Eve. An hour-long KENDRA ON TOP (We) was at 0.29, compared to 0.32/0.31 for two half-hours last week. On Lifetime, STEP IT UP upticked to 0.21, while JACKSONS: THE NEXT GENERATION fell 0.05 to 0.15. HBO’s REAL TIME WITH BILL MAHER was at 0.20. DAM tried a seasonal EXORCISM LIVE special and scared up 0.20. History’s TIME MACHINE and TRUE MONSTERS were both at 0.17. 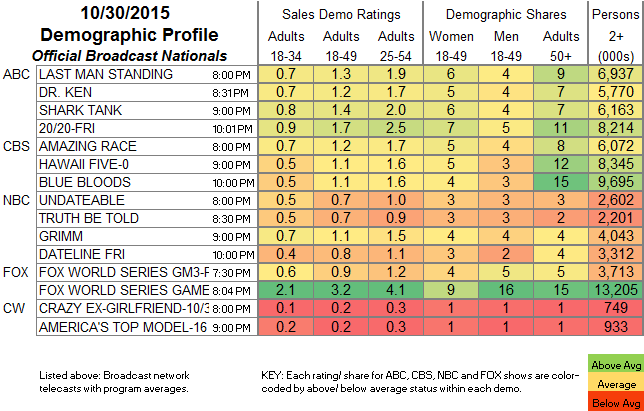 USA’s SATISFACTION is providing little of it in the ratings, down 0.09 to 0.17. Starz apparently ran a quiet “sneak” of its ASH VS. EVIL DEAD pilot at 12:18AM and found 0.11. THE KNICK (Cinemax) dropped 0.01 to 0.05/202K.